Dark forces are at work in a small Wisconsin community. At the cusp of the new millennium, Elena and Greg Bailey arrive in Green Springs to help her hospitalized mother. As they drive into town, cats are everywhere and seem more populous than humans. Within hours, Elena and Greg discover a horrendous scene in the nearby woods. When they report their finding to the police, the response is not what they expect. The local church with its tainted past and charismatic pastor has become the only house of worship in Green Springs. Eccentric, billionaire architect Marcus Ahriman manipulates events to suit his satanic mission. At the same time, two mysterious sisters confound Elena as they work behind the scenes for a higher purpose. If Elena doesn’t get to the bottom of the great wickedness in high places that’s at work in this enigmatic town, all humanity will suffer. The Year 2000 rolled over with the expected fanfare and disaster. Some computers died. Other systems thought they’d begun living a past life that began in 1900. Washington bureaucrats, not surprisingly, didn’t make hard decisions in time. Procrastinators in private industry committed the same mistakes. Committees studied issues to death and everyone lost. Vital programs remained unchanged. When computer clocks advanced to 00, they created the havoc foreseen by many. Social Security and Medicare payments stopped. One stock exchange crashed, causing millions of dollars’ worth of trades to disappear in cyberspace. Thousands of passengers were inconvenienced by the fumbling of a major airline whose flight timetables went berserk. The millennium bug affected people in every walk of life in one way or another. Fortunately, that was the good news. Spurred by predictions of global catastrophe and doomsday nightmares, many people opted not to face the turn of the century. In the midst of unrestrained celebration for the advent of the new millennium, mass suicides on New Year’s Eve, 1999, caused emergency police and fire crews to resort to drastic measures. Health officials took similar actions. Whole areas of cities were quarantined. As the body count rose, authorities stored corpses in private refrigerated vans and semi-tractor trailers until they could be autopsied. Many families lost more than one loved one on that awful night. The portent of cataclysmic disaster also took other manifestations. Sightings of unusual cloud or water formations were common. Animal peculiarities created a stir. One man swore his entire litter of pigs was each born with two heads. Pictures normally seen in the National Enquirer routinely appeared in the New York Times. Hysteria was the order of the day. In the months following that wild night, life slowly returned to normal. The changes to the computers were eventually made, people received their checks, the stock market hit new highs after its record decline, and travelers once again experienced predictable delays. Funeral homes and cemetery conglomerates reported record profits in the first two quarters. The argument around which date denoted the true millennium died down because those supporting 2000 had had their day. In the aftermath of the last New Year’s Eve and all that had occurred, the advocates of 2001, as the year marking the real millennium, didn’t receive much press. They were ignored and ridiculed as anachronisms whose doomsday prophecies were ludicrous. Perhaps their words should have been given more heed. Cats were everywhere. They sat sunning themselves on sills of large picture windows; they lounged under porch chairs; they perched on rooftops watching the passing cars; they stalked birds in trees; they peered from behind garage walls; they ambled down the sidewalk like they owned it. The cats were black and gray and calico and white; they had long hair, short hair, medium length hair, and no hair. Elena, a cat person, smiled as she steered the car around another corner to discover the same scene along this street. Here pairs of cats strolled side by side like lovers in the park. Greg frowned. Jacques, sitting in the back of the car, bared his fangs and growled deep in his throat. Stoli, with whom Jacques had arrived at an accommodating truce in their shared household, uttered a quick meow, and settled herself more comfortably on the car’s rear window deck above her canine companion. Several more turns revealed two more long streets filled with more cats than Elena had ever before seen in one place. The few people she saw walking along the sidewalk, rocking contentedly on their front porches, or engaged in animated conversation seemed not to notice the cats that were more populous than they. It was as if for these people the cats didn’t exist. It was one of the stranger sights she’d encountered in her thirty-five years, but she liked it. She’d had cats in her life since she was a child and would have been happy to have a household full of them. They were curious creatures, mysterious and otherworldly, and their presence opened portals in Elena’s mind that she believed would be otherwise closed. She often questioned their behavior, and it was that questioning, along with finding the occasional answer, that grounded and satisfied her. Her husband’s position on the subject, however, was decidedly less than neutral. “Come on, Greg, you’re exaggerating,” Elena said. Elena pulled to the curb in front of a huge Victorian house that was painted a picture-perfect gingerbread white and blue. Wrapped around the front and side of the house was a wide porch. The sign prominently displayed in the yard pronounced, Green Springs Bed & Breakfast. In smaller letters below, it said, We’re here to serve you. Interestingly, there were no cats in the near vicinity of the B&B. Greg got stiffly out of the car and opened the back door for Jacques. The Briard was panting heavily, frantically wagging his tail, and prancing on the seat as if in the next second his bladder might explode. He burst through the open door, his long, black hair streaming behind him as he headed for the nearest tree. Out of sight behind it, he emitted a seemingly audible sigh of relief. Stoli stretched languidly on her rear window perch, arched her back, and in two graceful hops joined Elena, where she plopped down next to her on the front seat. Elena stroked her back from head to tail, and the cat gave a series of short meows to display her pleasure. Petting Stoli gave Elena as much satisfaction as it did her pet, and she reluctantly stopped, saying, “Got to go now, Bebis.” Bebis was Elena’s nickname for Stoli, a distorted Americanized version of the Lithuanian word for baby. Elena rolled the car windows down slightly and stepped out. She called to Jacques, who came bounding back. Putting the dog in the car, she joined Greg on the entry walk next to the B&B’s sign. It was a fine mid-October day. Over the last week and a half, the weather had been unseasonably warm in the Midwest, unlike most of the summer, which had been cool to an extreme. A cold spell had recently hit the rest of the country, but not Chicago where they lived, or southern Wisconsin where they were now. She reveled in these few moments, watching the cats prowling the B&B’s far perimeter, enjoying the sun, the turning leaves, the quiet of the small town. Almost too quiet. Elena wondered why she didn’t hear any children’s voices. It was Saturday afternoon and the weather was wonderful. Surely children in the neighborhood would be outside to take advantage of this lovely day before the cold set in. She put the thought aside, held Greg’s hand, and basked in the sun’s rays a few more minutes. They rang the bell and entered the foyer. A rolltop desk with numerous pigeonhole drawers sat on a small oriental rug, which partially covered the dark hardwood floor. Off the foyer was a living room. It was built with an unusual architectural design of rounded corners, rather than square, at the ceiling and where the walls met. In the near-circular room were several comfortable-looking couches and chairs which invited guests to sit and relax. A tall, gaunt man with whitish-blond hair greeted them. At first glance Elena thought he was older, but on further examination she estimated him to be in his mid-thirties and closer to her age. He wasn’t nearly as big as Greg, who at six two and a hefty two hundred thirty pounds dwarfed many people, including Elena at her mere five-nine, but the B&B’s proprietor clearly looked down at her. His face cleaved into vertical lines with slightly sunken cheeks and made her think he’d be perfect in the role of caretaker in a horror movie. In a modulated, late-night FM music station baritone, he said, “I’m Peter. You must be the Baileys. I hope you had a good trip. My wife Julie is busy in the kitchen right now, so I’ll show you to your room.” He led them upstairs to one of four rooms on the second floor. Elena knew that Greg was hoping for a negative response. He didn’t want to be here in the first place and seeing all the cats around town had undoubtedly made him uncomfortable. Well, it couldn’t be helped. They were here in Green Springs for a reason, and they had to stay a while. Greg had agreed to it and would get over his reluctance. It was quite spacious with rounded corners like the living room downstairs. There was plenty of light, a comfortable sitting area, even a tiny, dorm-sized refrigerator. The far end of the room held a built-in bookcase and contained a small table on which sat a stack of white index cards in an open mahogany box. Peter showed them the bathroom, how to work the whirlpool, where to find the in-room temperature control, and where they could store their clothes. Everything looked perfect, and Elena said so. Peter shrugged his thin shoulders and led them from the room. He changed the subject by mentioning an upcoming art fair, and Elena forgot her question. Elena and Greg retrieved their suitcases from the car. They corralled their pets and brought them back to the room where they set out food and water for them. “All right,” Greg said, not sounding terribly enthusiastic, “but I need my inhaler.” However, instead of searching for it, he sat down and began perusing one of the specialty B&B magazines placed in the room. Elena didn’t comment on that statement, knowing it was true and a sore spot between them. She didn’t want to get started on a subject that seemed to have no resolution. They drove to the Green Springs Community Hospital on the outskirts of town where fewer cats roamed the streets. Inside they asked at the information desk for Elena’s mother. The elderly lady in a peach volunteer smock directed them to the hospital’s long-term care section on the west wing of the third floor. Halfway down the hall past the nursing station, they found the room. Walking in, Elena was shocked when she saw her mother. The television was on, and she was dozing. She had aged, her skin was jaundiced and had developed a rash. She had lost a lot of weight. Where before she had been a plump fifty-seven years old, she now appeared closer to a haggard seventy. It tore at Elena’s heart to see her in such a condition. Her mother had always been young and vital. What had she done to deserve this? How could someone with a conscience have done this to her? But someone had. Elena looked up at Greg with tears in her eyes, and he took her in his arms. Even with the differences that had come between them, she always felt so warm and safe when he did that. Greg was such a big man that when he held her she could imagine she was a tiny child wrapped securely in a huge cocoon. She sighed and wiped the moisture from her face. When she turned back toward the bed, her mother, awake, smiled wanly at her. The older woman clearly didn’t want to talk about it and diverted Elena’s inquiries. Their conversation ebbed and flowed. It see-sawed between trivialities and Elena’s attempting to learn more. The interchange alternated between English and Lithuanian. It meant that Greg couldn’t follow much of what they said. While they talked, he hung back and stared out the window. “Tu visada esi buvuse stripri, zuikuĉiuk. (You’ve always been a tough one, my little bunny.) Curious as a cat and so willing to ask many hard questions. Never content with easy answers.” Roma Kamantas turned her head to stare out the window into the afternoon sun. Her eyelids drooped. She fumbled with the TV’s remote control and turned it off. Her face softened into slackness. Someone pushed a cart down the hall, and the whispering whoosh of the wheels whisked by. A murmur of conversation from the nurses’ desk filtered into the room. The breathing of the older woman in the bed steadied and deepened as her body relaxed in sleep. “Darn,” Elena whispered, and turned with Greg to leave. Elena realized she was panting. The hard, staccato tones she’d spoken added to the ache in her stomach. She’d held back on her emotions since first learning of her mother’s situation. They’d been there, lurking in the background. Apparently, they weren’t something she could hide from forever. Sooner or later she’d have to consciously deal with them. It was true. He had fought this decision since she’d originally brought it up. Only with great reluctance had he agreed to accompany her. She appreciated his sacrifice, despite the pulling of teeth she’d had to go through to convince him. But what other choice did they have? If they didn’t come together, she would have come alone regardless. It would have meant an enforced separation of possibly up to a year. “Do you feel like taking a walk?” she asked. On the short drive back to the B&B, they continued to notice the high cat population, which was definitely greater near the center of town. Greg commented again how creepy it was. Elena told him he was prejudiced because he didn’t like cats. She pointed out that both of them were ultra-sensitive to change right now because of the decisions they’d had to make to come to Green Springs. Maybe not, she admitted to herself. Despite that, she silently told Greg, Deal with it. Jacques was waiting eagerly for them up in the room. He knew he was going out and pranced excitedly as they gathered themselves for their walk. Stoli lay regally at the head of the bed, upon what would be Elena’s pillow. With the tip of her finger, Elena stroked the distinctive white lightning jag above the cat’s left eye, then used her nail to ruffle the snow-white collar of fur that circled her neck and extended down her chest. The cat would be left to her own devices, as usual, and wasn’t in the least perturbed at the prospect of spending time by herself. Sunbeams slanted in through one window. They illuminated flying pet hairs and floating dust motes. Wherever they were, at home or traveling, the pets left their mark: the long black hairs that Jacques would sometimes leave in small clumps, or the finer black and white ones from Stoli’s tiger shading that often affected Greg’s breathing. Other than the usual slop of water from Jacques’ bowl, the room appeared undisturbed. The backs had nothing written on them. That was why Elena hadn’t initially noticed anything more than their presence. “Sure,” Elena said. She had read through the entire Bible once, a couple of years ago. Periodically, she went to church—usually alone because Greg wanted nothing to do with it. Because she’d never really connected with the teachings of the pastor, her religious inclinations were weak. Something, however, continued to draw her toward Christianity, but enough of it didn’t make sense to her that she’d never been able to fully embrace it. Despite that, the cards with the Bible verses bothered her at a deep level. She lay the two cards back down on the table the way she’d found them continuing to feel uneasy but not knowing why. “Come on, Jacques.” She shook off the discomfort and headed down the stairs. They left the question of the cards for later. The innkeeper pointed them toward a nearby forest preserve when they asked for directions, and they found it with no trouble. Half expecting a crowd of hikers on this beautiful afternoon, they were pleased to find theirs was the only car in the lot when they parked. Best of all, according to Greg, there were no cats in sight. They struck out on the path and were soon enveloped within the protective cloak of colorful leaves, gnarled black trunks, and tangle of fallen branches. Briards are members of the sheepdog family, French in this instance. For that reason, Elena and Greg had little concern about Jacques straying far from them. Sheepdogs have a herding and a homing instinct and tend to stay close to their masters. True to breed, he’d bound several yards off the path into the woods, sniff out an interesting tree or suspicious hole, anoint it, and contentedly rejoin them until the next adventure or smell presented itself. They’d walked about two miles when Jacques perked up his ears. He barked once and vaulted forward. In a moment, he began barking furiously. A man emerged along the path from where it curved around a clump of huge oaks. Showing no hesitation or fear, he extended his hand for the big dog to sniff. Jacques did once and recoiled, sitting down suddenly as the man continued toward Elena and Greg. He was small but barrel-chested, bordering on dwarfish, bald, and heavily bearded, the black beard bushing outward to fringe his lower face. He wore a sleek, riotously colorful skin-tight shirt, black leather pants, and highly polished black boots. The shirt appeared to contain a mass of intertwined drawings and pictures. 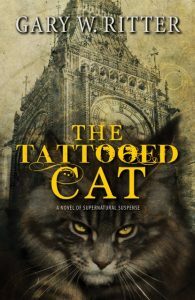 Elena noticed one that featured a lone gray cat with striking yellow eyes sitting prominently in a wooded clearing, the sun beating down, yet incongruously, seemingly paying homage to the cat, as though the cat were the master of the sun. The scene was different and engaging, and drew her in. Before she could look more closely, the man diverted her gaze with a broad grin and a cheerful greeting. “Beautiful day for a walk, no?” He passed them by without another word. “I was going to mention something to you, too,” Elena said, “I think it was about Jacques, but I don’t remember it now either.” She shrugged, forgetting the moment and walking forward. Ahead of them, Jacques was racing around barking. He raised his head and sniffed. His nostrils flared and his large hairy ears whipped back and forth as he shook his head. He started forward, halted, growled, ran back toward Elena and Greg, stopped, whined, and repeated the sequence three times. On the fourth repetition of this strange behavior, Jacques came up to Greg and grabbed his sleeve between his teeth, pulling him off the path, even as Greg resisted. As big as Greg was, he couldn’t oppose the pull of the hundred-pound Briard. “He’s really worked up. I suppose we should see what’s causing it,” Elena said. “I suppose,” her husband agreed. As soon as Greg relented and appeared to be following, Jacques let go of his arm and led them. He kept looking back to make sure the humans were coming. Satisfied, he went a little farther before checking again. They followed Jacques as he bounded through the woods. Floating down gently around them, the leaves of the October maples seemed like giant scarlet and yellow snowflakes. They mounded into rainbow piles that created barriers between the trees. When Jacques encountered one that seemed impassable, he exploded through it. He was eager, yet in a way reticent, to find the source of what beckoned him. Elena and Greg trailed in the dog’s wake and kicked their way through the rustling foliage. It was a glorious afternoon. The temperature was right, and the colors like a snapshot out of time. Elena began to hear a low, moaning sound that increased in volume as they approached its source. It had a familiar tone to it but was more resonant and frightening than anything she’d previously heard. The dog whined but obeyed. She tied a marker to a tree and took Greg’s hand to walk closer to whatever this terrible noise was. She glanced back and saw that Jacques was where she’d left him. Good. Rooted to the spot, he had laid down and covered his ears with his front paws. By now the sun was setting, and late afternoon shadows were darkening the woods. Where earlier, the sun had streamed in with brilliant afternoon rays to brighten and warm their path, the cool of fall had begun to creep upon them. Elena shivered as howling filled the air. And she smelled it for the first time. A heavy feline odor. The musk of hundreds of cats. Overpowering. Three more steps took them to a clearing in the woods where the last light of the afternoon shone down upon a gathering of more cats than Elena had ever seen or imagined. There weren’t just hundreds. There had to be thousands. And they were all moaning in unison. They were all sitting, arranged in a rough circle, the center of which Elena couldn’t quite see because the cats were so numerous. But they were surrounding something which was most definitely not cat-like. She started picking her way through the outermost cats, heading toward the center of their circle. “Oh, all right.” He wiped his nose on his arm, took a shot of his inhaler, and stepped gingerly among the seated cats which continued their unearthly cries. The stench of so many cats overwhelmed even Elena’s tolerance and she, likewise, began sneezing. Because of his asthma it had to be difficult for Greg in this feline throng, and she immediately felt contrite at her insistence that he follow her. She’d always been less than sympathetic to his condition, thinking it was a state of mind and a weakness he could overcome. Amidst the cats, they both sneezed and teared, and wiped their eyes and noses, but kept making their way centerward. The diversion of personal preservation had the effect of preventing their fully seeing the source of the cats’ attention until they were upon it. “This is terrible,” Greg wheezed, more concerned with his nose and lungs than their destination. Elena paused to wipe her eyes again and almost vomited on the spot. Greg bumped into her, sniffled, finally saw what she had, and retched. He turned away and spewed over the cluster of cats to his side and rear. The cats behaved as if nothing had showered them. They ignored his gagging, putrid vomit and sat transfixed, uttering their plaintive wails. The sound was piercing here at the center of the cats’ focus. Elena stepped over the last several rows of cats. In the small clearing, which the cats had left open, was the body of a female. It was a child, maybe six years old, blonde, clothed in a torn and bloodstained pink party dress with white ruffles. Elena gasped at the next revelation. She closed her eyes for a moment to stop the dizzy reaction that claimed her. From the gaping hole in the child’s chest, Elena could see pooled and coagulated blood, the broken ribcage, and more flies than imaginable. What she couldn’t see, what she kept telling herself had to be there—that she was mistaken—was the missing life source. The girl’s heart had been ripped from her body.